I know you clicked this page cause you saw "Street Team" and thought, "What's that?". Well, if you love The Talisman Series and told your friends about it, then... I want to reward you and invite you to be part of my peeps, my closest fans, my TEAM! Snag a banner below and post it on your blog, website, twitter, myspace, etc. Pick a team: Nicholas, Julia, Phil, Enigma and post the graphic. Tell 10 people OFFLINE about the Talisman Series who have never heard of my books before. Tell 10 people ONLINE about the Talisman Series who have never heard of The Talisman Series before. Refer 10 people to join The Emerald Talisman Facebook Page. Recommend the books to 10 people on GOODREADS who haven't shelved the books yet. Share the Emerald Talisman trailer with everyone you know. Host it on Facebook, your blog, forums, Tweet the link, etc. WRITE me asking for bookmarks so you can hand some out or include in contests! Ask me to do an interview, character interview, blog day, give-away, etc on your site! Add my Browse the Book widget to your blog, MySpace, Facebook, website, etc. Blog about The Talisman Series. Request a copy of The Emerald Talisman & review it! (Honest reviews, please) and share it at Amazon, B&N, Facebook, MySpace, Twitter, etc. Tag your friends! Recruit peeps to SUBSCRIBE on my blog so they never miss a post or contest. Spread the word and place links to content, trailers etc in other paranormal romance reader message boards, comment sections of articles about similar authors, as well as the comments sections of friends and social networking sites. Tell everyone you know about the books. Link them to purchase books on Amazon, B&N, etc. Make a fan trailer and post on YouTube. Think up some new ideas and I'll add and credit you on this list! 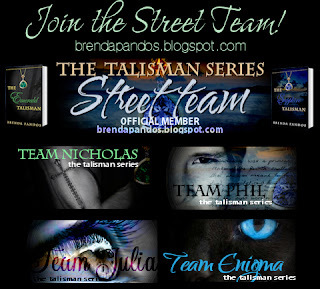 All Street Team members will get a special, exclusive, autographed Street Team bookplate for their copy of The Emerald Talisman and/or The Sapphire Talisman and a special bookmark with charm. Check out FREEBIES on how to request this. NOTE - these bookplates are special and only for Street Team members. Talisman Team Members will have their names listed in the acknowledgment section of The Onyx Talisman! Hurry up - you don't want to miss out on this! Team Members will also have exclusive contest, story excerpts, deleted scenes and contests not available anywhere else. There will also be ARC (advanced reader copies) giveaways and T-Shirts or other special items. If you'd like to join this exclusive club, just click here to join the Yahoo group! 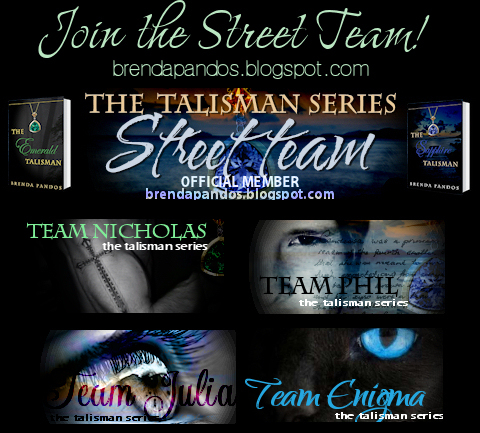 Click to join The Talisman Street Team! If you have posts, blogs, pictures, video, whatever beyond these listed, please send links to brendapandos@gmail.com or tweet me the link @brendapandos so I can thank you and RT.